Now that Lilly is sitting up, we have started some sensory play which is super important for her brain development and her understanding of how the world around her works. As an early childhood educator myself, I have been aching to get started with some fun play experiences. I am trying to set aside one day a week for some new play activities. Our latest play experience was spaghetti and boy did she love it. I simply boiled a big pot of spaghetti and added a few drops of food dye while it was cooking away. You can definitely skip this step or use natural food dyes such as beetroot or spinach to add some colour. As you can see, the spaghetti was very well received and Lilly couldn't help having a little taste, an important part of sensory play especially for little babies. I'm not sure who had the most fun though, me or her! I just HAD to help her pop some spaghetti on her head - it was really funny and sweet to watch her try to work out what was going on and how to solve the problem of not being able to see! 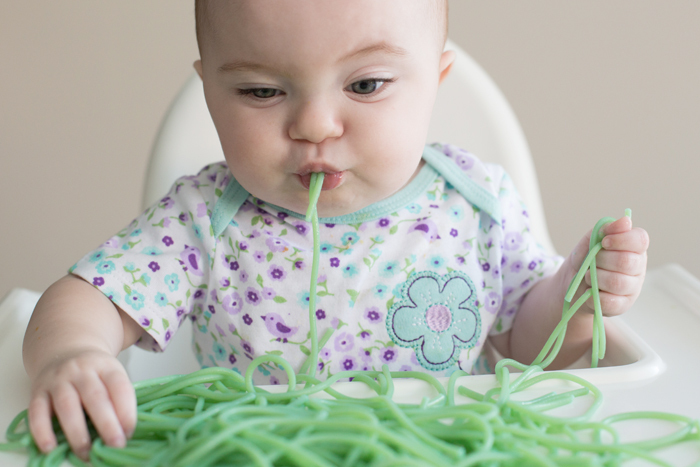 A lot of people shy away from sensory play because it can be very messy (as is baby led weaning!) but it really is so much fun! I am so looking forward to trying lots of new sensory play with Lilly as she grows. And I will be looking forward for more of your sensory play blogs. Physical activities tends to make kids learn and grow faster both mentally and physically and man! They are fun than anything else.